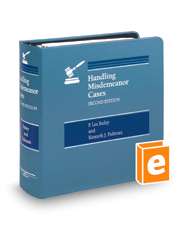 This work details the basic concepts, strategies, and procedures involved in handling misdemeanor-level cases, as well as tactical elements of pretrial preparation. Part 1 provides coverage of key areas of criminal litigation, such as quasi-criminal matters, arrest and arraignment, plea bargaining, motions to suppress, presentence reports, pretrial exclusion of evidence, motions to dismiss, and right to a jury trial. This work also addresses special considerations when defending juvenile clients. Part 2 examines possible defenses as well as tactical considerations at trial for a number of specific misdemeanor charges, including assault, larceny, contempt of court, drunk driving, and other vehicular crimes.